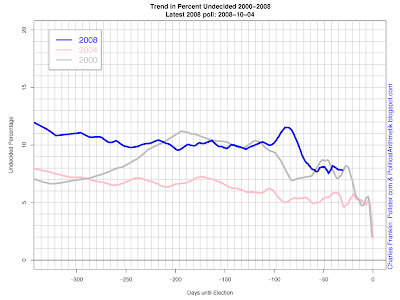 The 2008 campaign had not seen a really big move in preferences until the financial crisis hit three weeks ago today. Since that time, the Obama-McCain margin has shifted almost 9 points in Obama's favor, converting a small McCain lead into a substantial Obama advantage. This swing reversed the gains McCain made with the Republican convention and the week after during which he picked up about 4 points and took the lead for the first time since March. I wrote earlier that we had not seen a move in 2008 as large as ones we saw in both 2000 and 2004. That is no longer true of 2004, though the current run is not yet as large as the one Gore mounted in 2000. 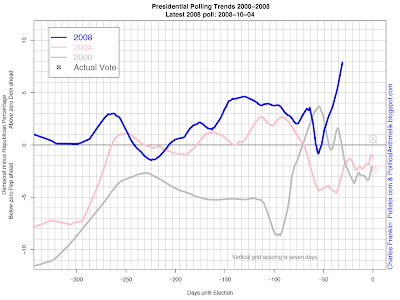 The Bush counter-assault in 2000, after Gore's surge, was almost eight points, and began at almost the same point in the campaign, about 57 days out. Voters are making up their minds at about the same rate as they did in 2000. If this year follows that pattern, look for some serious decision making over the next two weeks.